It's not Crown Lynn (well I'm pretty sure it's not, as it's a rough surface where as the Crown Lynn swans I've seen are all smooth) but since it looks the same I'm guessing it's made from those "overseas moulds" they used to make the Crown Lynn ones with. 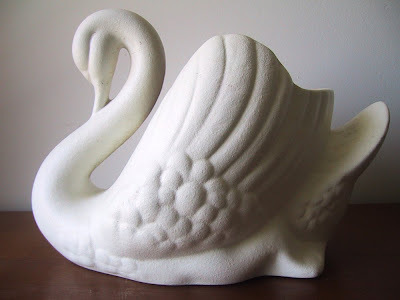 Whatever, for $10 at my local Vinnies, I decided this not-Crown Lynn swan was better than the rather more expensive real mccoy! Sometimes you just have to heed the call of the op shop: and yesterday I'm particularly glad I did. Seven Johnson Brothers fruit plates. Well eight actually but one had a large chip on it so was binned as soon as I got home. I'd first seen these about a month ago as part of a tea set and tried to get them to sell me only the plates but as they had just arrived that morning they said no. I wasn't prepared to pay $35 to get my seven plates (and re donate the tea pot and cups and saucers) so said I'd be back in a couple of weeks and if they were still there we'd have a discussion. So I did and we did and the plates were mine for $7*. I'm very happy as I only have 4 of this size, picked up from David Jones who told me at the time they were the last in the country. So now I have too many of them but having three spare is rather useful. 500g Caressa yarn (partly knitted), 250g 8ply wool (which must be quite new as the label declares real wool), 180g 12 ply Norspun yarn and a vintage 25g ball of Patonyle (that last one's for Taph): $7.50* the lot.